Michael Kalish, in his pursuit of portraying American and International Icons, helps us experience the power of Muhammad Ali in a very new way. The use of bent metal and the clear patterns of numbers and letters combined with outlines and shapes, lends visual immediacy to Kalish’s work. This characteristic immediacy of impact is also the product of the forceful presence of large areas of colored, bent and embossed metal being placed either against plain colored backgrounds on walls. This immediacy of visual impact has very precise cognitive consequences for the viewer as the artist noted that “…they notice the form first and then the medium”. In other words, the immediacy of visual impact forms the basis of cognitive response. Looking closely at Michael Kalish’s work it is clear that all the elements contribute to re-enforcing the sense of immediacy. The license plates themselves with their alphanumeric images are designed for ease of recognition and legibility, although the artist turns this into a characteristic visual tension by allowing an unresolved contrast to exist between the signification on the plate itself and its new role within the image. Its visual power is derived from the use of what he identifies as “...the everyday aspect of found objects taken out of context”. This preference for creating tensions between opposing pictorial forms is also seen in the works where images of movement are contrasted with the static form of the frame. 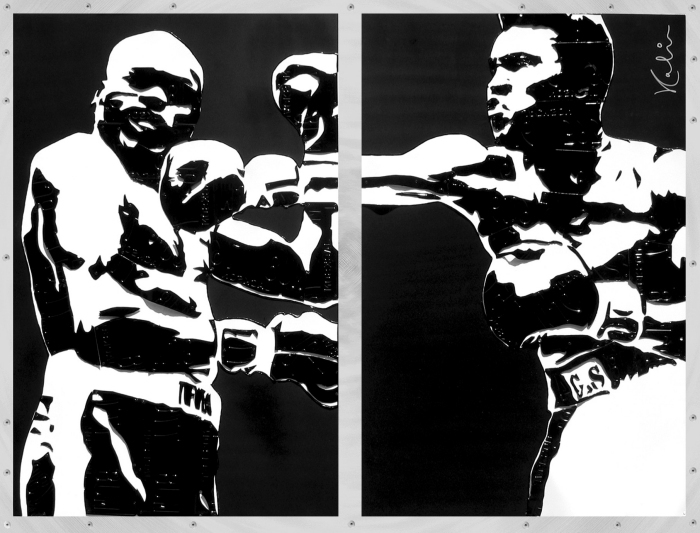 For example, in Ali vs. Jones, 2004, the dynamic experience of the punch thrown by Muhammad Ali is hung across the static-dividing vertical of the central line of the diptych. The copyright to all works belongs to the artist or artist's estate. We have no affiliation with these entities.